At a day’s walking distance from Khoma village are the idyllic sub-tropical villages of Khomakang and Denchung, lying close to the Khomachu (river). Khomakhang has eight houses and Denchung has six houses. The two villages are about half an hour apart. An hour or so short of reaching Khomakang is a clearing in the slope called Nyanglema. Steep stairway of fields created by imposing stone retaining walls at Nganglema make any traveler curious about its cultivators. There are derelict fields smothered by thick sub-tropical scrub and neglected fruit trees. It was where a number of people lived for over a decade from the mid 1970s onwards, in geographic confinement. Those who lived here began farming, but the slope was so steep that this could be done only by ingenious contour bunding with stones, soil and wood. Directly in sight from Nyanglema, across the deep green gorge, is a gigantic waterfall cascading down into the Khomachu. Those who lived in Nganglema might have appreciated this stirring and uplifting vista more than anyone else. Direct aesthetic experience of nature can always be alleviating. A possible site of a dam was pointed out a little downstream below the water fall. It was rumored that a hydropower station will be constructed on the Khomachu. The people of Khomakang and Denchung were impatient for the motor road to come when construction begins. They will lose the most lucrative horse-hiring they do today. I estimated that each horse they own is making, rightly, better money for them than hiring out four wheel drive in Thimphu, and they would do better by protecting this localized monopoly. At the same time, bringing motor road will destroy the opportunity for transformation of consciousness of pilgrims and travelers triggered by walking arduously and thinking piously for long through forests. 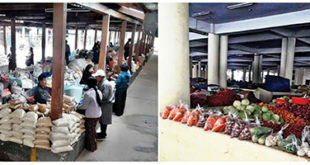 Renting out pack horses seems to be the main cash income for Khomakang and Denchung villages. 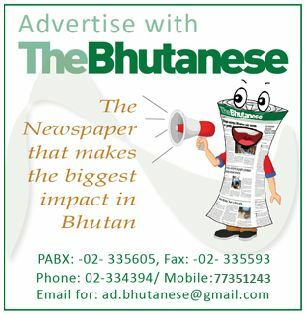 Hire charge for a horse per day was the highest in Bhutan – Nu. 800 in 2009. It reached Nu 1400 per day in 2012 before it was reduced by administrative order to Nu 1000 this year. In 2009, the total cost for hiring four horses for six days (three days up and three days down) was Nu. 19,600, and the same number of horses for the same duration is costing a minimum of Nu 24,000 this year. Daily hire charge for a Tucson or Santafe SUV is Nu. 1,400 but it carries more. Horses from Khomakang and Denchung have a natural monopoly over the route from these two villages to Singye Dzong and back. The horses of Khoma, being acclimatized only to warmer subtropical zone, cannot go up to Singye Dzong. They often collapse either from altitude sickness or from eating aconite plants. As it is not advisable for the horses, even from Khomakang and Denchung, to be allowed to graze in high altitude, the muleteers carry grain feeds for horses. The villages of Khomakang and Denchung are also collectively called Tsango. The people of Tsango claim that the original word for their village is Sa Ngo (sa ngo ma, True Land) and was identified by Guru Rinpoche. Why the people call their land Tsango still needs a word of explanation. The ancestors of the people of these two villages were settled long ago in Tsango, a wide-open plain on the slopes of Nyongla, which also refers to the snowy pass that has to be crossed to go to Tashi Yangtse. The old settlement at Tsango, consisting of 105 houses and sustained by rich wheat and barley fields, were abandoned most likely in late 18th century. There is no clear account of why they left the striking place but fear of poisoning each other and harvest failure are vaguely mentioned. 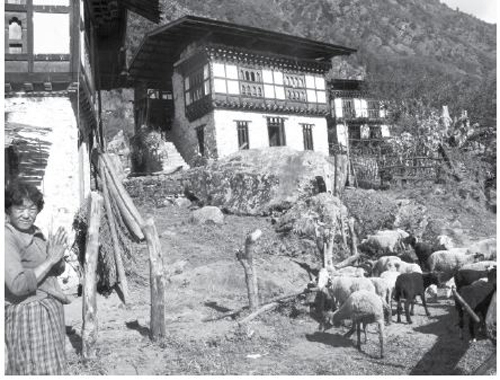 Tsango was taken over by nature while most of its people dispersed in Tashi Yangtse and some came down to what is today known as Khomakang and Denchung. The people of Khomakang and Denchung still honour their ancestral deities of Tsango during their local commemoration which is off-limits to outsiders. Even local people who enter the arena of the deities’ commemoration are first cleansed by odorous of plants. 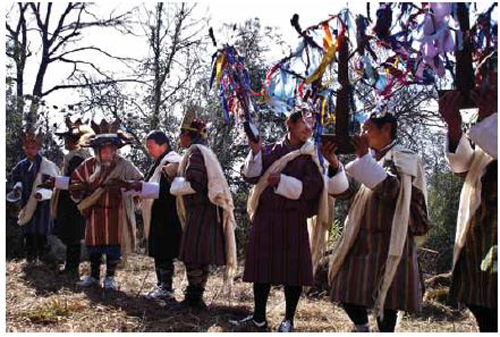 The occasion is held at Tsango to receive several high Bon deities of the area, such as Guru Zhey and Trowo Tala Membar, from Nyongla mountain which is their abode. The frequency of the ritual, called Khablha, is once every second year. Bon chief priest Lhami is distinguished by a black hat and ri-nga (rig lnga) to which pamzar(spam gzar) rather than dabchang (brdab dpyangs) are attached. He is surrounded by a bevy of subordinate Bon priests. In its ancient form of the ritual, the chief priest of Bon who presides over the festival had to go into retreat in the nearby spacious cave before it commences. Success of his retreat and a favorable outlook for the coming year was discerned if a goral or Himalayan Serow drifts into the cave by the power of his meditative focus. I am not sure which species they mean, but both can possibly occur in that broadleaf area. The Bon chief then trapped the wild animal for feast offering to deities and festive consumption. The wild animal thus sacrificed was deferentially called ‘Yeshey Norbu’, the wishing fulfilling jewel. People from Denchung and Khomakang and Tashi Yangtse reach Tsangno on 7th of the 11th lunar month, corresponding roughly to second week of November, to spend around five days in festivity and ritual, renewing their immemorial bond with the deities of Nyongla. Though their ancestors have dumped Tsango so long ago, they cannot let go off the place, for their deities wouldn’t let them go. The people of Khomakang and Denchung feel extremely blessed and chosen. They believe that if the world comes to an end, their land, people and villages will be immune from destruction, and will continue to exist. They have, I felt, the true spirit of border people. They are self-sufficient. Fertility of land and warm climate are conducive to growing amaranthus, maize, foxtail, millet, rice, chillis, beans, bananas and plums in these two villages. They also keep sheep, horses and cattle. Denchung is the last human settlement on the trail to Singye Dzong. Yet the households of Khomakang and Denchung have very limited farm land, being bounded by the mighty river on one side and a steep cliff on the other. They will not be able to support themselves by farming unless there is land to expand, acquire and cultivate in proportion to the growth of the population. Such information is known through discussion in the evening when the local people come to greet the pilgrims with greetings of copious amount of ara. They finish ara at impressive speed by themselves after the drink is heated in butter and eggs. They have admirable good manners nevertheless. Such relaxed moments uninhibited by ara can lead to discussion of issues on historical and legal ownership they had in terms of wheat fields on the other side of the river in Tsango, where, as I noted earlier, they go every year to conduct their annual Bon ritual. Timely access to this land depends on a bridge which they build every year. Monsoon river washes away the bridge every year, making it too costly and too labour intensive endeavour for a small population. They did not put it up again. As a result, during the last land registration and survey, their land across the river was not measured by the surveyors. It was also not mentioned and insisted upon by the farmers. Due to this ‘innocent’ omission, they say, land titles have been subsequently dropped from their thram or legal register that was newly issued by the Land Commission. The solution to farming on a larger scale as population expands was not difficult to see if land shortage can be overcome. It would be deeply desirable for the population along such strategic routes and border lands to increase for strategic reasons. But there is also good living to be made in these frontiers. The language the people speak in Khomakang and Denchung on the pilgrimage route to Singye Dzong is the same as the one spoken in Dakpa Tshosum. According to rites they intone before deities during the Tsango commemoration, they originally came to Tsango from Dakpa Tshosum, a region within Tawang. Dakpatsho is the area closest to the border of Bhutan across Tashi Yangtse. My intention here is to briefly note the ethnic origin of the people of Denchung and Khomakang as recalled by them for the transmission of their identity and history. Dakpa Tshosum is roughly coincides with Lumla Administrative circle. People of Khomakang and Denchung claim that the people of Mon Tawang were originally descendants of Lha Tshangpa (Brahma), and therefore they call themselves Tshangla. Yet others claim that the people who came to Tawang, and from there to Tsango, were Tibetan and Khampa. There were more than one group of people in Tawang. Among the Tibetan groups are families who claim descent from Lhase Tsangma, the brother of King Tride Songtsen, who came to Bhutan in 836 and is the ancestor of many noble families in Bhutan. This broad group of people of Tibetan ethnicity refers to themselves as Komo and Rokmo, because the Komo came from Kongpo, and the Rokmo came from the Rok region of Central Tsang. People who claim descent from Lhase Tsangma call themselves Jowo (lord). But the regions of Tawang were religiously influenced by Terton Pema Lingpa (1450-1521). 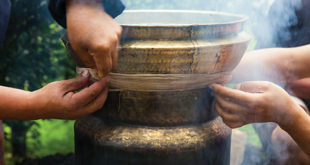 Terton Pema Lingpa had retrieved in public view a throm ter – a ritual vase – from a place in Tawang just below Lungla from the side of the river, according to oral tradition of Tawang people. Pema Lingpa’s younger brother, Ugyen Zangpo married Dorzom in Tawang and settled in Ugyenling in Tawang. The traffic from Khoma to Pangkhar, and from there to Khomakang, and thence to Tsango and Tashi Yangtse across Nyongla and further to Tawang must have been familiar one in ancient period. Such caravan route was also route for marriages. How such a marriage between families of two places so far apart is inconceivable today because of disconnection between places. Until the invasion of the Mongol martial leader, Sokpo Jonkhar, the monastery of Ugyenling followed the Peling tradition. The 6th Dalai Lama, Tshangyang Jamtsho (1683-1706), was born to the direct descendants of Ugyen Zangpo, after seven generations, in Ugyenling in Tawang. After Khomakang and Denchung, the cross-overpoints across numerous streams were temporary (in 2009). The pilgrim traffic to the Singye Dzong is considerable and running them down. The pilgrimage route stretches all along on the left side of Khomachu. It is thickly-forested, narrow and hot. Pilgrims can view and enjoy on the right side of the Khomachu the towering, snowy peaks of Nyongla. The military outpost of the Royal Bhutan Army is a short 20 minutes up from Denchung. It is known as Tsikang. In the language of Khomakang, ‘tsi’ means river and ‘kang’ is ‘nearby’. At the outpost, any traveler can be challenged by soldiers. Route permit have to be produced for anyone to proceed further up. This kind of frontier protection, checking and guarding would have depended crucially on the people of frontiers in the past. People who live on the frontiers can still play a major role; depopulation of borderlands can be a risky trend.